Does anyone remember making popcorn on the stove as a kid? I would always burn it, and ruin my mom’s pots. Then came along the hot air popper, which was much better. Then came microwave popcorn that I thought was the best…I ate it all of the time until I discovered that the ingredients in the flavoring were not too good for me. So, after years without popcorn, I am happy to report that you can pop your own in the microwave! This might not be news to you, but it was to me when I saw my co-worker pull a small brown paper bag out of the microwave, and pour out perfectly popped popcorn. This is much better for you and a heck of a lot cheaper than the microwave packs. Please note: some microwave manufacturers say that brown paper bags are a fire hazard, so use your judgement, and don’t leave the microwave unattended. Pour about half an inch of popcorn into the bag. Fold the top over 2 or 3 times. Place in the microwave and cook on the popcorn setting. Listen for when the pops become less frequent and avoid burning. It took my bag about 25 seconds less than the popcorn setting. Pour into a bowl and top with melted butter, and sprinkle with a salt of your choosing. Or you can just eat it plain from the bag. 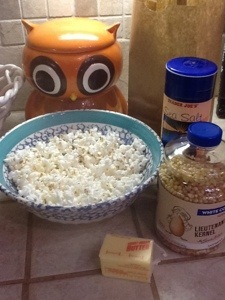 Posted in crunchy, references, recipes and tagged Popcorn. Bookmark the permalink. I’m going to try that! I’m embarrassed by how easy it is. People keep telling me this works, maybe it’s time to buy some kernels. There’s a microwave in a student lounge, and people pop corn all the time. I’d like to see the look on their faces when I do it w/ a paper bag! It’s really easy, just be careful not to let the popcorn burn. Thanks for reading! Fantastic! I’m going to have to try this as well. My kids eat popcorn all the time for a snack. Thanks for sharing! It’s obvious when you think of it but I wouldn’t have! Thank you! Yes, no oil needed! Yay! leaves more calories for the sweet stuff! Yeah Sweetaddict! Yet another great idea on your blog! You go girl!!!! Thanks so much Lynn, you made my day! My husband used to make it this way! Popcorn is his favorite late night snack. I will definitely try this! I LOVE popcorn and eat a LOT of it…..it’s my go to when I’m hungry but not too hungy!